NEW YORK, July 10, 2017 /PRNewswire-USNewswire/ -- Perlmutter Cancer Center at NYU Langone has announced the creation of a multidisciplinary center of excellence to develop innovative approaches to diagnose, treat and prevent pancreatic cancer. The new Pancreatic Cancer Center brings together laboratory researchers, surgeons, oncologists, geneticists and others throughout NYU Langone to create a comprehensive care model to address this usually fatal disease, projected to be the second leading cause of cancer death by 2020. Key to its mission is cultivating an environment in which science and industry collaborate on the discovery and development of new technologies and therapies. Interdisciplinary "team research" will involve all areas of medicine -- from basic science, through drug development, to implementing new treatments in the patient care setting. Internationally renowned pancreatic cancer surgeon and researcher Diane M. Simeone, MD, leads the new Pancreatic Cancer Center. She joined NYU Langone's faculty this past March following a distinguished career at University of Michigan's Comprehensive Cancer Center. Dr. Simeone also is the incoming chair of the Scientific and Medical Advisory Board of the highly-influential Pancreatic Cancer Action Network, one of the country's premier organizations advancing the fight against the disease through research funding, community engagement and government advocacy. 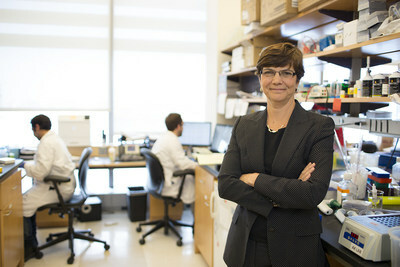 Dr. Simeone heads up an already strong pancreatic cancer team at Perlmutter Cancer Center, whose researchers are world leaders in cancer biology, metabolism and immunology, and whose patient care providers are experts in new approaches to imaging as well as the surgical and medical management of the disease. Besides adding her own research program to this group, Dr. Simeone will help recruit additional investigators and clinicians. "Advances in many areas of cancer biology and genomics have created an unprecedented opportunity to drive discoveries that have real impact on patients, especially those with lethal diseases like pancreatic cancer," Dr. Simeone says. "It is our obligation to step up to this challenge." The clinical and research direction for the new Pancreatic Cancer Center also will help advance NYU Langone and its Perlmutter Cancer Center as a major site for cutting edge clinical trials for the disease. Dr. Simeone and her colleagues will continue to investigate the molecular events important in pancreatic cancer development specifically identifying biomarkers for early detection and new therapies that improve survival. "Unfortunately, the medical community has limited ability to prevent pancreatic cancer, detect it at an early stage or treat it effectively," says Benjamin G. Neel, MD, PhD, director of Perlmutter Cancer Center. "For these reasons, we have identified improving pancreatic cancer outcomes as among our top priorities." Through the Pancreatic Cancer Center, patients will have access to a team of clinicians, most of who will be located or will practice at Perlmutter Cancer Center's main facility on East 34th Street and 3rd Avenue. When appropriate, patients also will have the opportunity to enroll in promising clinical trials on new drugs to fight pancreatic cancer. "In the past, pancreatic cancer took a back seat to the investigation of other forms of cancer," Dr. Simeone says. "But the increasing number of cases has changed that. We will advance the most promising laboratory findings to the clinic in the shortest possible time, improve clinical trial design and efficiency, facilitate data sharing, and capitalize fully on technologic advances that will one day lead us to an early detection test for pancreatic cancer." A patient coordinator can help facilitate appointments with clinicians affiliated with the Pancreatic Cancer Center. Please call (212) 731-6150 or visit nyulangone.org/locations/pancreatic-cancer-center.